The California Water Code establishes the California Water Plan as the guiding document for water management in the State. 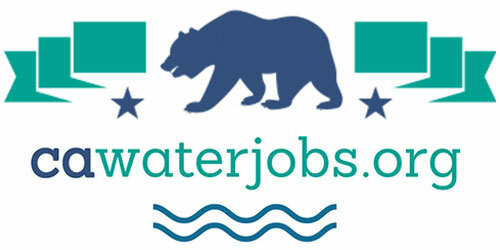 The California Water Plan is updated by the Department of Water Resources every five years. 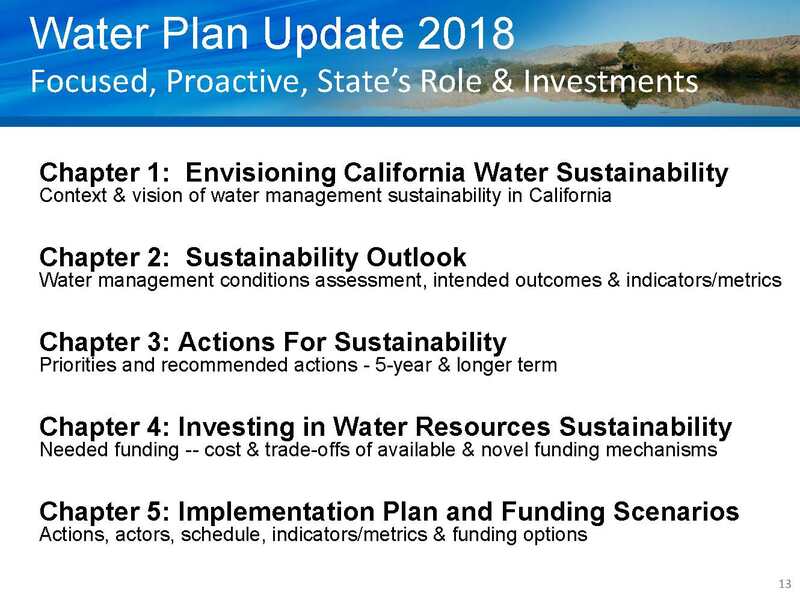 While in the past, the California Water Plan has been produced as a multi-volume document which included detailed regional reports, resource management strategies, and an extensive strategic plan, the Department has charted a new course for the 2018 update, saying that the updated plan will be considerably more concise to better reflect priorities of current and future generations. The update will focus on identification and prioritization of long-term funding and sustainable investment in water resource management needs and will include new sections on a five-year State investment plan for water reliability and sustainability, as well as a funding plan and an illustrative funding portfolio. At the November meeting of the Delta Stewardship Council, Kamyar Guivetchi, Division Chief and Manager of the Statewide Integrated Water Management Division for the Department of Water Resources gave the council an overview of the evolving document. 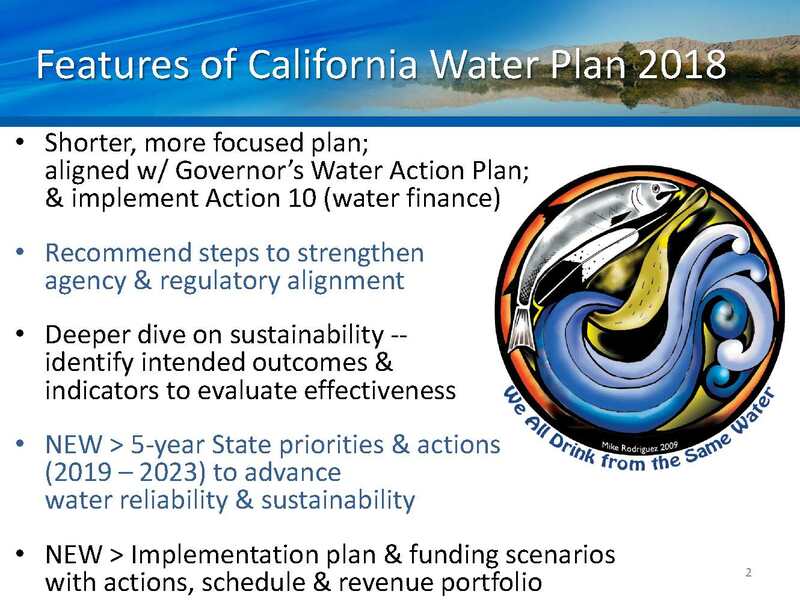 The California Water Plan has been on a 17-year journey with each of the Water Plan’s from the year 2000 building on each other, but Kamyar Guivetchi said that with this update, they want to take a different approach. In the past, the focus has been on advocacies that were not necessarily aligned or consistent, and those advocacies were focused more on actions and projects. However, in order to move toward a more sustainable and integrated approach for water management, more focus needs to be on the outcomes, much more so than the actions, and the assessments has to be on the investments and actions that move us toward those outcomes, he said. Mr. Guivetchi pointed out that the state’s reactive management practiced over the last many years has caused the state to make band-aid investments to fix aging infrastructure and enact regulations to try to overcome legacy impacts and unintended consequences of our past decisions, and yet this has not and will not provide a sustainable water management system. So the 2018 Water Plan update is intended to be a deeper dive into what is meant by the term sustainability when it comes to water management. The Water Plan update defines water sustainability an ongoing, resilient, and dynamic balance among societal values: public health and safety, a healthy economy, a vital ecosystem, and enriching experiences that recognize that the public and many people use water for cultural practices and for recreation, and value it for its aesthetic values. Better alignment of the state’s very decentralized and fragmented water governance structure is needed; he noted that there are 30 members on the state agency steering committee, and that’s just the state government, not to mention other local as well as federal entities. Capacity building is partly the facilitation and engagement of all of the entities. 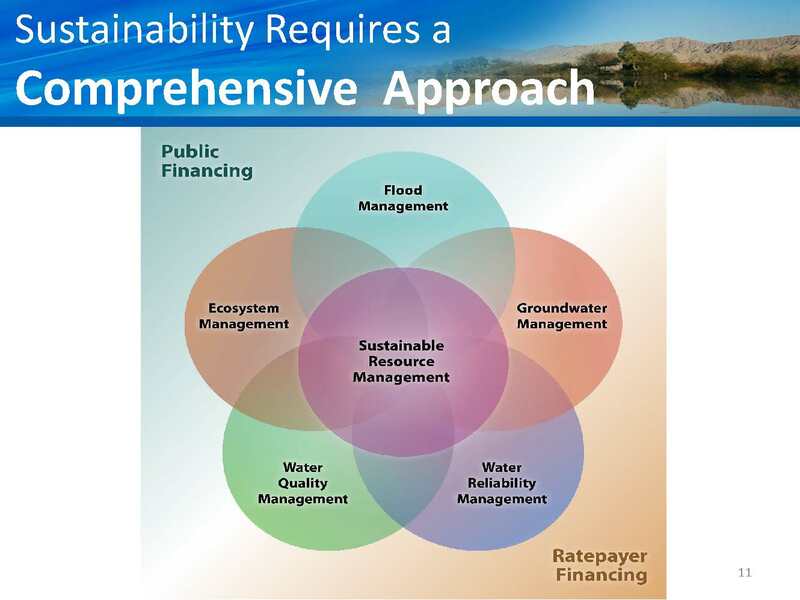 Mr. Guivetchi acknowledged that many communities throughout California do not have the ability or the resources to do the level of engagement necessary to have effective, integrated water management at a regional watershed/water basin scale. He also noted that the state’s infrastructure, both green and gray, natural and constructed, needs rehabilitation as well as modernization to prepare for extremes that are projected to occur with climate change, and this will require sufficient and stable funding at all levels to accomplish the work that needs to be done. 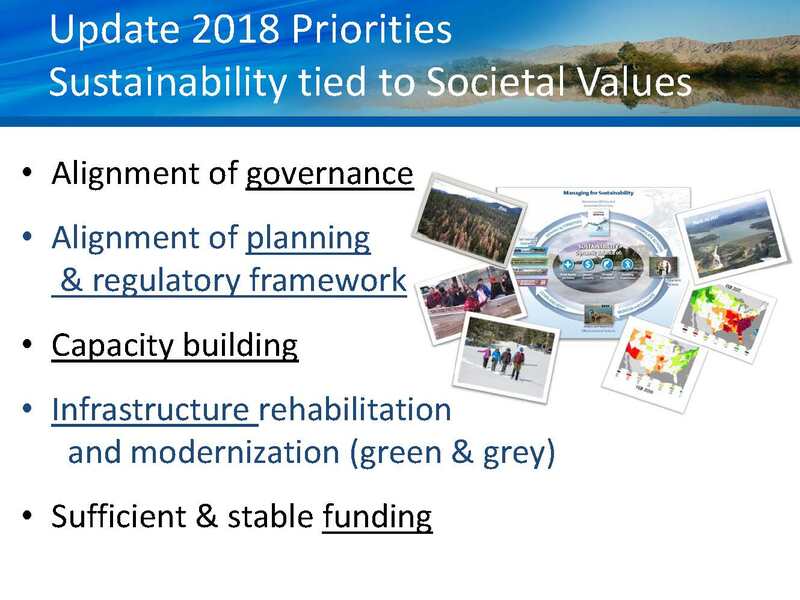 Reaching sustainability also requires time; this update is seen as a cornerstone that will be improved and evolved over the next three to four cycles of the update, he said. For each of those update cycles, they intend to follow a more deliberate management cycle that will set the intended outcomes, identify the actions that will get to those outcomes, do the monitoring and assessments of whether those actions provided us the outcomes, and then adapt and improve with each successive cycle, he said. The Water Plan update will have five chapters. 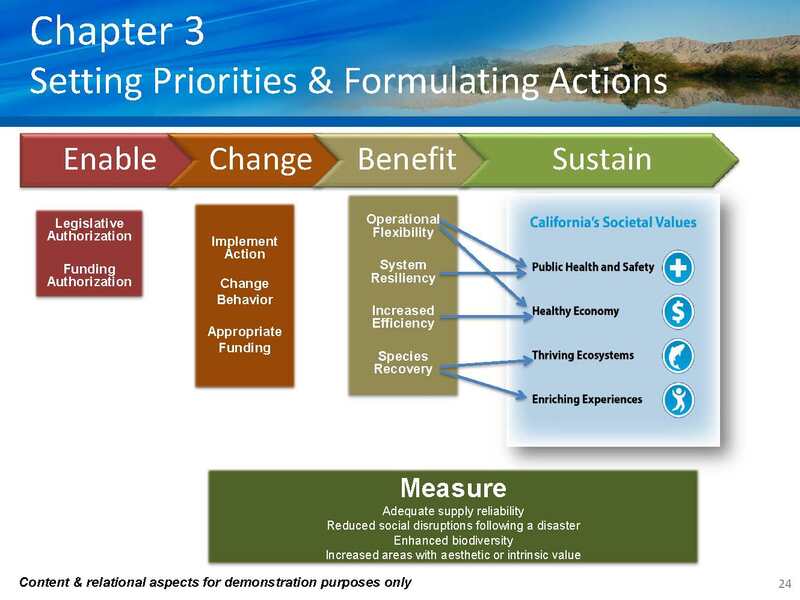 Chapter 1 will give the narrative of the tale of two extremes, and what needs to be done as a state to move toward a more sustainable water management system. 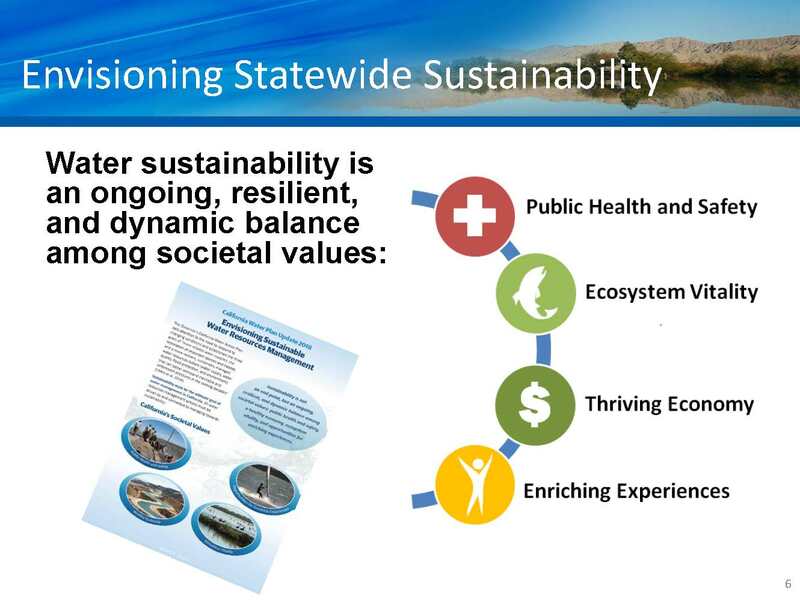 The sustainability outlook will include a manageable set of indicators that will give a first line of indication if things are moving in the right direction or if something needs further attention; then there will additional indicators that will be more vast and detailed at the watershed scale. Mr. Guivetchi then gave an example of a basic indicator for the societal value of public health and safety: One of the 12 outcomes defined at the state level is a reliable water supply for domestic needs, sanitation, and fire suppression, and one of the indicators would be water supply vulnerability to wildland fires. He also noted that none of the four societal goals is just about water supply; water supply are outcomes within multiple societal values, so a reliable water supply is implicit and shows up under more than one societal value. He presented the slide (upper right) with the table to demonstrate that for each of the four societal values, there are two or three outcomes. 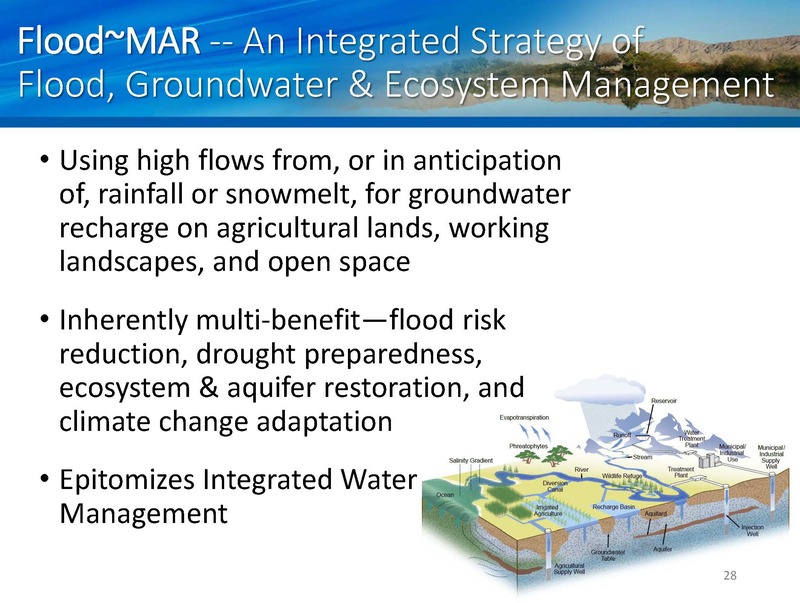 He also noted that the Department is doing watershed-scale pilots in the Russian River and other areas to demonstrate the value and energize people from other watersheds to being applying this indicator framework. Chapter 3 focuses on setting priorities and formulating actions. It also includes recommendations, many of which are about enabling conditions such as funding, legislative authority, and governance. The recommendations are about making change in the way things are implemented such changing behavior through a grant program or a regulation as the way to change behavior is either through incentives or oversight. The chapter also contains indicators and outcomes that are system-wide such as improving groundwater levels and restoration of ecosystem functions, and then ultimately tying those all back to the four societal goals through measurement and assessment. Chapters 4 and 5 are still in development. 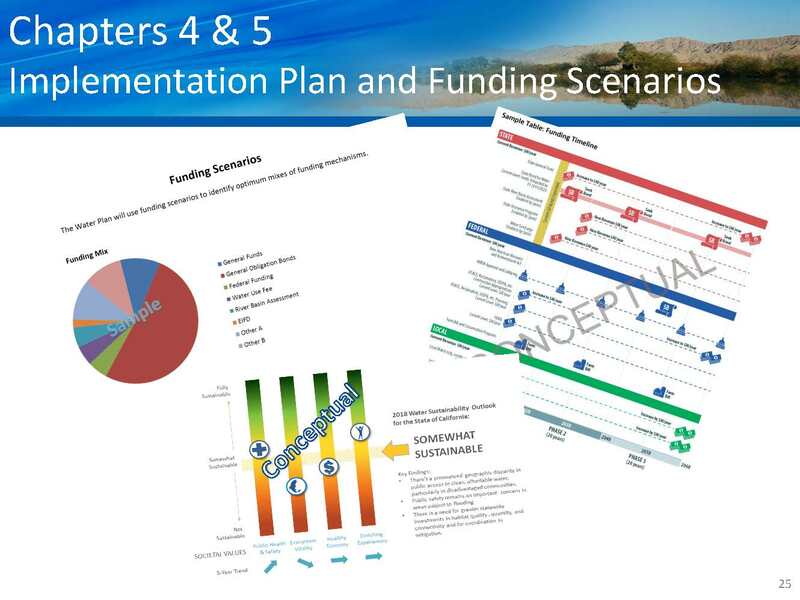 There are ongoing workshops that are discussing funding scenarios. Since the actions in Chapter 3 can be costed out, the next question would be how to pay for them. So rather than coming up with only one approach, they are going to develop funding portfolios: One portfolio might lean more heavily toward bond funding, another toward sustained general funds, and another might look at novel funding mechanisms through regional local assessments, he said. 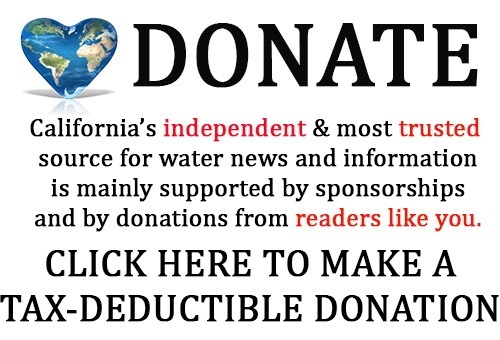 “We don’t think the Department of Water Resources or even the Water Plan should make that decision, but we need to put the information out to the legislature, out to the governor, and any future administrations so that they can decide if we are committed to doing these actions and this is what it will cost over the next five to ten years and what would be the portfolio of revenue that would work for the state,” said Mr. Guivetchi. In October of 2016, they launched our communication and engagement for the update and have held several meetings throughout 2017, one of the most recent ones being the second annual plenary meeting in Sacramento in September. By January, they need to have an administrative draft done so a public review draft can be available in February of 2018, he said. The Department of Food and Agriculture recently held a managed aquifer recharge public forum during which using floodwaters for managed aquifer recharge was discussed. A discussion draft white paper was developed by DWR and others to promote discussion about the benefits, potential, barriers, and obstacles to doing this more particularly on agricultural and working lands in the Central Valley and the Central Coast. The white paper will be finalized by the end of the calendar year. 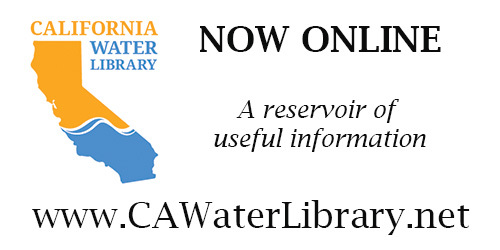 For the California Water Plan Update 2018 website, click here. For the agenda and meeting materials for the November meeting of the Delta Stewardship Council, click here.